I hadn't heard that DMC is discontinuing their memory thread. Oh, NO! What to do!!?! Fortunately, Kreinik has you covered—use their Hot Wire instead. Hot Wire is size 16 Kreinik braid with wire in the middle so it is bendable. This nifty article has a conversion chart between DMC's colors and Kreinik's. They even tell you how to make your own color in memory thread using a regular size 16 braid. By the way, Kreinik now calls Hot Wire by Wired Braid instead, which is more descriptive, I guess. UPDATE: It occurred to me that many folks have not used memory thread, so here's Mary Corbet's review of it. In the eternal question, Rubber Bands Versus Pop Tops, Kreink comes firmly down on the side of pop tops! So do as they suggest and protect your metal threads from contact with rubber. By the way, I was terribly embarrassed decades ago to realize that the reason I couldn't get the thread to come off the Kreinik spool is that I didn't know the top came up! Pretty funny now. Many thanks to the kind folks at the ANG email list who enlightened me as to the reason and solution. As Kreinik says, "Safe and Sane Storage Forever!" Copyright January 30, 2018 Jane M. Wood. All rights reserved. Little Bird Designs has a new website, one that features not only their needlepoint canvases, but other fun products. You can pick up tote bags or backpacks, read the Little Bird blog, or check out the travel cups and t-shirts with some of their fun designs. Enjoy exploring. © Copyright January 25, 2018 Jane M. Wood. All rights reserved. Not every period of history upholstered chairs with needlepoint, even though we tend to think of it as an older style. I thought you'd like to read about the transformation of a needlepoint chair into a leather-covered one to make it more authentic for the museum where it lives. And yes! They saved the needlepoint! The incredible Carole Lake has a new book out and I just got my hands on a copy. 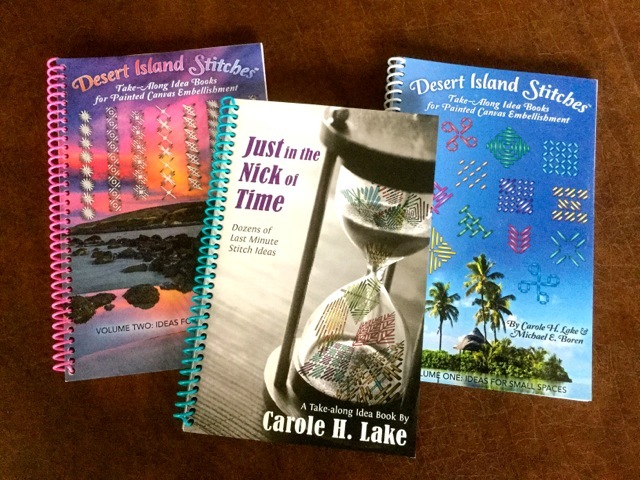 Like the Desert Island Stitches series Carole wrote with Michael Boren, Just in the Nick of Time is a small spiral-bound book that will fit in a suitcase, briefcase or stitching tote quite easily. What makes this book special and why you will want to buy it is laid out in the introduction. Let me quote Carole here--"Do you ever look at your painted canvas and wonder what on earth to put in a particular spot? Just in the nick of time, here is a book of suggestions." And that's exactly what this book is, a response to your SOS when you get stuck on a section of that painted canvas driving you nuts. Carole continues in the introduction, explaining that there is no index, just an alphabetical list of stitches she uses that she hopes will inspire you the next time you go blank on what stitch to use. 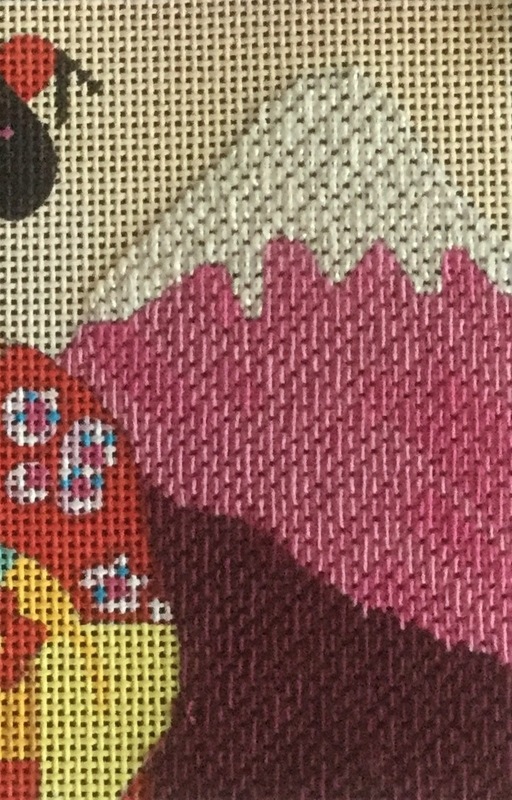 She recommends you switch threads, colors and even look at the stitch diagrams with the book turned this way and that, looking for just the right angle, all ways to make the stitch uniquely yours and perfect for your canvas. The front and back cover are plastic coated cardboard for durability. The book has 35 pages of stitches, usually one on each side of the paper, so you have nearly 70 stitches diagrammed for you inside. Plus there is an introduction and an explanation of tent stitch, continental stitch and basketweave. Each stitch in the "Stitches" section is diagrammed at the top of the page in a gray scale diagram, perfect for those who have vision problems. All the stitches are numbered so you can follow the steps involved, and a few have two diagrams to further explain the stitch. The true value of the book is in the text under each stitch diagram. Carole talks about the best path to take to create the stitch, the threads she thinks work especially well for that particular stitch, explains where she has used it, and often reveals variations that will make the stitch extra special. I'm sure most of us have used Mosaic Stitch at one time or another. But Carole explains that stitching Mosaic Stitch in diagonal row is the easiest way to get an even tension and helps you figure out compensation. 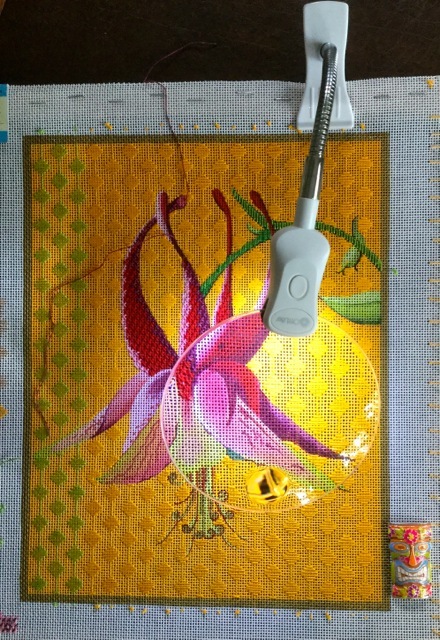 She talks about using Mosaic to shade and how it lends itself to architectural stitches. All great information, and this is just one stitch of many. If you are new to embellishing painted canvases, this book is going to be your new Best Friend. It is jammed full of great ideas that are not going to be hard to execute. I suggest that you read this several times, letting all the great information sink in, then carry it around to pull out whenever you get stuck. A quick flip through the diagrams is sure to find something that will work, whether you are trying to find a perfect stitch for fur, windows, water, clothing, backgrounds or anything else you will find on a painted canvas. A really experienced stitcher will probably know most of what Carole talks about, but most of us are regular stitchers, not experts, and if you don't have someone like Carole in your stitching group, this little book is going to come to your rescue again and again, just In The Nick of Time. And if you are an expert stitcher, Carole has come up with a few things I've never heard of. It's a cozy little book to settle down with and read, just for fun. I'm betting whatever your level of needlepoint expertise, you'll want to revisit this little book again and again for inspiration. Full disclosure: Carole sent me a copy of this for review. I really really like it! © Copyright February 17, 2018 Jane M. Wood. All rights reserved. Ruth Schmuff has announced the next Mystery with a Twist class, Annie O'Brien Gonzales' "Let's Fall in Love," which will start in April 2018. You are probably familiar with mystery classes—they are available at Ruth's shop or via mail order over a few months. But the Mystery with a Twist class is a long-term project, spread out over 2-4 years with a class arriving via mail order only about every six months. It's for the relaxed stitcher who is happy to have plenty of time between lessons. If you are interested, you can sign up via Ruth's website. Stay tuned! As photos from the current lessons are posted on Ruth's blog, I'll update this article…. UPDATE: Ruth starts with the background areas, all in yummy threads and stitches. Louise's Needlework has started a new page on their website with links to their very useful tips they post in their newsletters. Here's the link. Visit often as they add more information. © Copyright September 6, 2017 Jane M. Wood. All rights reserved. 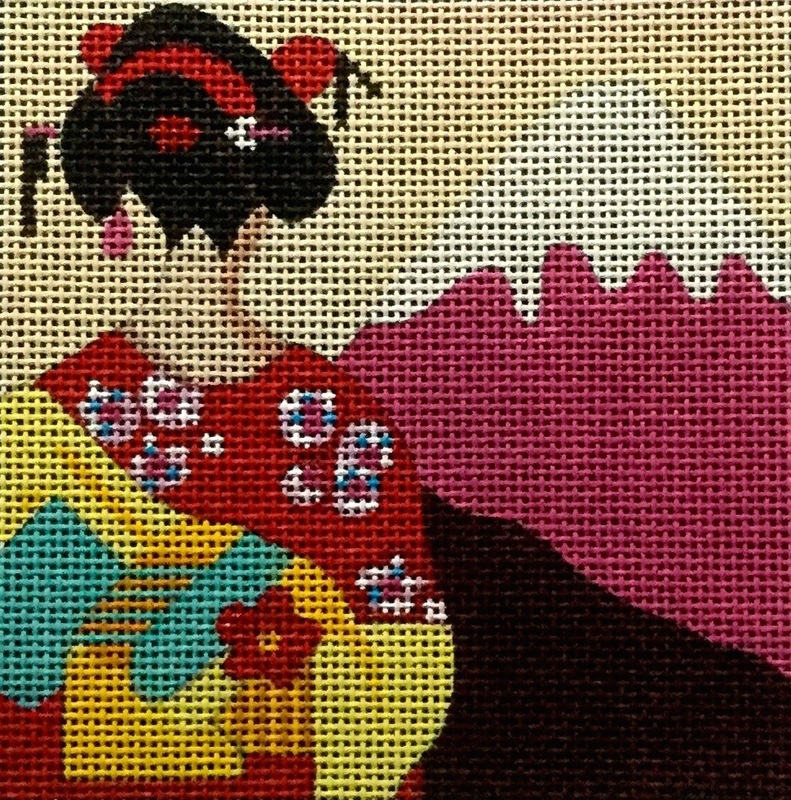 Fiber Talk has three new interviews with needlepoint designers available. First up is Lorene Salt, counted canvaswork designer. Lorene creates amazing geometric designs. You can browse her designs, classes and available charts here. The second interview is with Diane Bertelson. Her name may not ring a bell, but I bet her company name, Pepperberry Designs, does! Browse the Pepperberry website and prepare to fall in love there, too. The third is with Diane Herrmann, teacher and designer of the iconic "Walking the Water's Edge." Here is her site, of course! By the way, Fiber Talk did a video tour of Sign of the Arrow which is on YouTube. Hint: it's not just another needlepoint shop. Kudos to Gary and Christine for making wonderful needlepoint audios and videos. © Copyright January 17 2018 Jane M. Wood. All rights reserved. Is Water the Secret to Knot-free Threads? Jean Farish says that dampening your threads to remove the kinks before you stitch with them is the key to avoiding knots and kinks as you stitch. Here is how it is done, step by step with photographs. Thanks, Jean! © Copyright January 17, 2018 Jane M. Wood. All rights reserved. There's a new book out on historical embroidery, based on floral items in the collection of the Embroiders Guild of the United Kingdom. Mary Corbet has done a nice review and overview of the book. If you are interested in historical needlework, you probably will want to track this one down. Today is Valentine's Day and it is also the start of Gay Ann Rogers's Valentine Day sale of her kits. Gay Ann's charted designs are feminine and beautiful and only sold a few times a year. Because it is Valentine's Day, a lot of her designs will be hearts. The sale starts at 8 a.m. California time today. Have fun exploring and seeing what treats Gay Ann got us for Valentine's! Bobbin and Fred has a fun article up about Valentine Day gifts for stitchers. There's something for every taste and nothing is too expensive, either. Have fun checking it all out, and perhaps making your own list of perfect Valentines for needlepointers. © Copyright January 30, 2018 Jane M. Wood. All rights reserved. Take a closer look a the area where the burgundy turns into pink and the pink turns into white. The stitches in burgundy reach up into the pink area. I did not compensate the edges of that area. I think in most cases it is better to continue the stitch rhythm instead of shortening a stitch to stop that color at the edge. 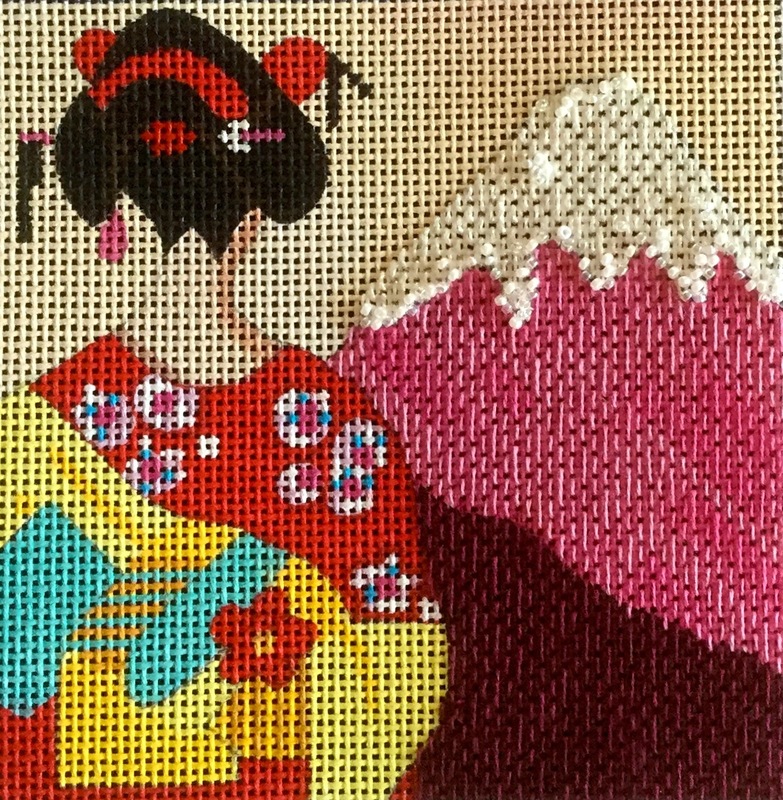 However, I did compensate the white area at the top of the mountain somewhat where it will bleed into the sky since I'm going to use a different stitch for the sky. I also compensated somewhat at the white-pink edge as the change from a medium dark pink to white is pretty drastic. I really didn't need to do that, however, as I ended up putting beads on top of the white-pink edge to create clouds and snow on Mt. Fuji. The beads hide any compensation I did or did not do. Compensation is an interesting topic. I usually don't compensate between areas as I think it is more important to continue the stitch rhythm, but there are lots of exceptions to that rule. © Copyright January 15, 2018 Jane M. Wood. All rights reserved. Horse Country Chic just visited Chuck Pinnell Leather, the home of the most beautiful leather goods you can imagine. While she was there, she got to see a custom needlepoint handbag Chuck just made for a customer. It's gorgeous! These won't be cheap but they will last a lifetime and look good always. © Copyright January 16, 2018 Jane M. Wood. All rights reserved. Should I Prewash My Red Threads? Test all threads before stitching. Just cut a 6-12inch length off the skein of thread and swish in cool water. You will have color release if the thread is not color fast. If the thread bleeds I recommend flushing out the excess dye just to be sure before setting any threads with a vinegar rinse. If the thread does not bleed check for color transfer by blotting with a white cloth or paper towel. If you have color transfer I wouldn’t stitch on a project that would run the risk of coming in contact with any liquids. Just projects to be framed or ornaments. As a finisher who has blocked hundreds of needlepoint items each year for over 30 years I have experienced a variety of threads that bleed. Red is not the number one color to bleed. 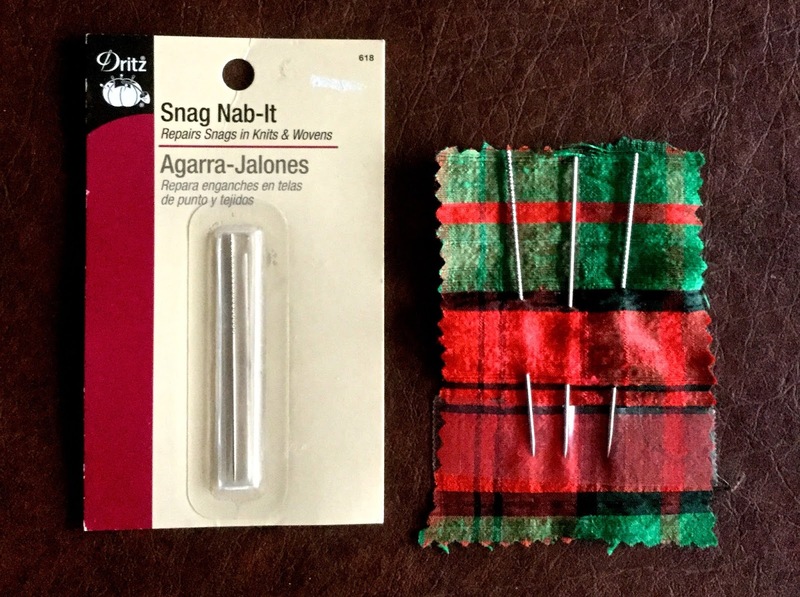 Green and Burgundy threads are more problematic than red threads. Certain overdyed thread manufacturers jewel toned threads bleed the worst. I personally will not stitch with any overdyed threads without testing for color fastness first. I have had red thread run orange and brown thread run red. I even had a black thread run for the first time in 2017. Silk threads are no more likely to bleed than other thread type so test all threads. I really agree with that advice! I have often found that the deep colored metallics and the overdyed deep color metallics are often problems as well. Navy blue, burgundy, and forest green can be real problems in any thread (even embroidery floss/stranded cotton) or yarn. Some threads or yarns are also color fast to dry cleaning and not to water, as well. Before beginning to stitch, think about the final purpose of your piece and test your threads/yarns if it is something that will be used and may eventually require cleaning, such as a pillow. Then, always use a frame and have clean hands when stitching. Those two steps will modify the need for cleaning and blocking the completed piece. Thank you both very much for your help! I've added links to Margi's company and Pat's book for those who are interested. © Copyright January 13, 2018 Jane M. Wood. All rights reserved. Natalia Frank of Natalia's Fine Needlework has released a new free rug chart for 2018. Natalia describes the new rug this way, "Each year I offer a new free pattern as my "thank you" to all friends, customers, all stitchers who was by my side through the life time and supported my business. You inspire me to work harder. Thank you for keeping my motivation up. This year I would like to offer a pattern for Konya carpet that has been charted based on the original 18th century carpet that is located in The Mevlâna Museum in Konya, Turkey, the mausoleum of Jalal ad-Din Muhammad Rumi. The rug, based on the motifs, symbolizes fertility and happiness. The pattern is charted for use of DMC floss, but my advice would be to use over dyed thread to give that antique and worn look to it." Natalia does this every year as a thank you to her customers. This is designed for 48 count silk gauze but you can adjust the ground fabric and threads to suit yourself. © Copyright January 12, 2018 Jane M. Wood. All rights reserved. Accoutrement Designs shows off the perfect patriotic magnets for the Olympic stitcher. If you are stitching to the Olympics you may want some of these. It's that time of year again! The needlepoint exhibit titled a Needlepoint Love Story is about to open again at Thistle Hill, sponsored by Historic Fort Worth. Note that this year stitchers from Oklahoma City are taking a train to the event, stitching all the way! There is usually a chart you can buy to commemorate each year's exhibit and raise funds. You can see past heart ornaments here and get a sneak peak at the new one. Use the right side arrow to seek both pictures. The heart charts are sold at the exhibit and by local shops. I just happened to see this photo of Kaffe Fassett working a puzzle someone made for him from a quilt done in his fabrics on Facebook. I had a puzzle made from a photograph of my mother's cat for her for Christmas one year. This is the place I used. It never occurred to me to do a piece of needlepoint as a puzzle, though. It would make a wonderful gift for the right person. Needlepoint For Fun's latest article covers various ways to start and end threads, including information as to what situation each way works best in. It's a great little tutorial if you want to expand your knowledge about how to secure thread ends. Pat at the Needleart Nut blog has been organizing her beads. This appears to be similar to what Pat used. © Copyright January 11, 2018 Jane M. Wood. All rights reserved. If you love threads, you'll want to watch the latest video by FiberTalk. Yes, I know FiberTalk normally does podcasts, but this week they interviewed Mary McGuire on camera to learn about her favorite threads. You will see Mary's projects and hear her explain what thread was used where. Very interesting! By the way, I'm guessing that these are the Wubbers flat-nosed pliers Mary mentions at the end of the video. The latest newsletter from Amy Bunger is out and it's a honey! There's a rave review of Carole Lake's newest book, new products, new classes and guides, and finally—some wonderful tips Amy picked up at a retreat for cleaning and repairing your needlework. If you are really intrigued by the cleaning and restoration tips, or need such services, check Nancy Lukoski's website. UPDATE: Fiber Talk interviewed Nancy in 2018. It's a great interview! Ok, here's something I've not seen before—turkeywork with beads! This is Julia Snyder's idea and Suzanne did a great job with it. The canvas is from And More, which is Julia's canvas line, and it uses her line of beads, too. Suzanne's doing a nice job with this, trying lots of techniques to make it something special. Hope we get to see this finished before too long. Someone asked about the clips that are used on the side of frames to attach fabric to the frame, particularly Q Snaps. I found these on Nordic Needle's website. This brand is called Stitch Clips, but I think there are other brands that are similar. © Copyright January 9, 2018 Jane M. Wood. All rights reserved. Before Thanksgiving (where does the time go?!) I bought an Ott light on sale at Joann's Fabrics. Now that I've used it for a while, it's time to post a short review of how it works so that folks looking for a light-magnifier combination can see if this might work for them. 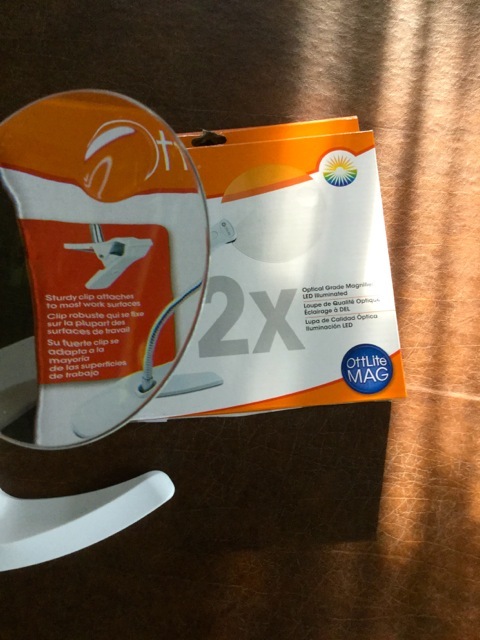 As you can see in the photograph, this is a clip on light with a bendable arm, LED lights and an acrylic magnifier with an insert for extra magnification. It also has a removable heavy base if you want it to sit on a table instead of clipping it to a table or your stretcher bars. Here's more information about the light-magnifier. Note that the magnifier lens is five inches in diameter and it runs on four button batteries which are included in the box. I've never used the heavy base as I either clip the light-magnifier to my stretcher bars or my desk. The clamp will open up enough to hold onto my desk that is nearly an inch thick so I think it will work on Evertites. The light is not particularly bright, however, and of course if the LEDs go bad they cannot be replaced. I also don't use the little extra magnification area much as it is so small. I also find the magnifier head quite heavy. It will tip over when it is clamped to the stretcher bars or make the stretcher bars a little unwieldy to hold, so I normally clamp it to my desk instead. The flexible neck isn't very flexible, either. It only bends a little to each side. I would prefer a longer, more flexible neck myself. The canvas above (Barbara Elmore's "Fuchsa" from Sundance) is around 16 inches high, to give you a sense of scale. To sum up, this is a useful tool with some limits. It's a little too heavy to put on regular stretcher bars and the extra spot of magnification in the lens is small. The neck isn't very long or flexible. The light isn't awfully bright, either. But it is useful when you need a little extra help to see and since it is fairly small and light weight, it would work well as a travel tool, especially in combination with a lap or table stand. If you need a boost, this might work well, particularly if you can find it on sale like I did. © Copyright January 8, 2018 Jane M. Wood. All rights reserved. If you are a fan of English-style tapestry, then you will enjoy looking at Jolly Red's blog (Dec. 26, Dec. 29 and Dec. 30, 2017) where they have several articles showcasing the stockings they finished this year for customers of their designs. The designs and execution are traditional but with a modern English twist. If you want to order one of their kits, here is their website's home page. Have a Merry Old England Christmas! © Copyright January 7, 2018 Jane M. Wood. All rights reserved. The TNNA Winter show for 2018 is in Las Vegas, Nevada, from January 26-28. The Nashville Market is the first weekend in March (counted designs). By the way, Stitch By Stitch Larchmont has a Pinterest page where they list all the new canvases they've heard about. It's a good overview of the new things. 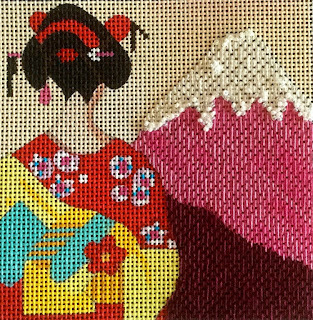 The Needlepoint Group of TNNA is starting to post sneak peaks from various designers on their Facebook page. Pocket Full of Stitches is posting lots and lots of images on their blog, which is great for those without Pinterest or Facebook accounts. I'll list them all here, latest on top. This listing has new magnets, thread colors, laying tools, Puffin's needle threaders and magnets, and canvases. BeStitched has listed all their canvases from Las Vegas in one place on their website. Needlepoint.com has also listed all their canvases. Jan at Point2Pointe has new cuff bracelets in team colors. I think Point2Pointe also sells the metal bracelet forms to make this up. Chris posted a neat desert scene from Waterworks on Facebook. Nice! Enriched Stitch is having a Kimberly Ann trunk show and shows off new designs from Kimberly Ann. ThreadworX has six new colors of overdyed Kreinik! Juli at JP Needlepoint has a new design called "A Circus of Our Own. 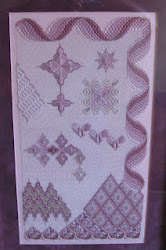 LizArt's fourth lesson on Advanced Bargello Techniques is ready for purchase. This one is called 2-4-6 Bargello. The four lessons (and more) are available on Liz Morrow's website, second link below. Eye Candy's Catch a Falling Star series is now available in a more traditional red/green Christmas color scheme. Carol Gantz shows off her latest design for Associated Talents. BeStitched shows off the newest (mostly) animal designs from Purple Palm in a little video. Needlework Retailer shows off one of the double sided flower canvases available only from Rittenhouse Needlepoint. David McCaskill has a new Easter-themed two part canvas available. These are line drawn with full instructions. Anne Fisher Needlepoint has a new "Blue Orient" glasses case with the ability to choose your own background color. Nice! Foxwood Crossings is teaming up with Threadnuts to offer three new charts kitted out with Threadnuts threads to counted canvas workers. All you'll need to provide is the canvas. Annie Lane has a new custom design exclusive to Needle Works in Austin, TX. It's called "Deep in the Heart of Texas." "Blueberries" is a new canvas from Julie Peschke Designs. It also looks like she's updated her website (second link below). Machelle Somerville shows off three new designs for March 2018. JP Needlepoint introduces "K-9 Squad," a new piece in honor of Juli's retired policeman husband. Kate Dickerson shows off three new designs from Patience Brewster, all Valentine-themed. Here's "Leo the Lion Hearted" who is new from JP Needlepoint. BeStitched shows off the latest from Purple Palm Designs. Bedecked and Beadazzled shows off two of Ruth Schmuff's older designs reworked into collages. Jinny reports back on her Kirk and Bradley English Wildflower Basket class at TNNA. Thread Gatherer has a new line of threads called Aurora, a silk and wool blend with a strand of metallic. Mag Friends has the new Double Heart needle minder for that special someone. Trish Burr's new Great Horned Owl is magnificent! The kit will be ready to sell shortly. Denimflyz plans to update their Etsy store with new canvases in 2018. Kimberly Ann Needlepoint has introduced a new #SheStitches kit collection, designed to encourage young women to stitch. Accoutrement Designs has new Mag Friends. The link below shows the new macaron series for March. Macarons are little almond meringue cookies with an icing layer between two of the cookies. Kathy Rees is releasing a new Needle Delights design at the Nashville market for cross stitch. It is called "Cobblestone." Jody Valentine's Cracked Chicken design now comes in large. 've heard about but not seen the new Chatter Buddies line of magnets from Meredith Collection. Fleur De Paris has a new website. This page shows their newest designs, which happen to be mostly Sandra Gilmore. 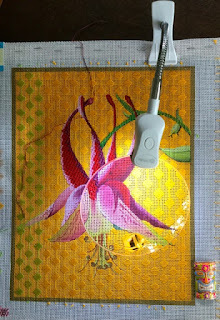 Cindy has created a new canvas for Barbara's Needlepoint. No snickering. Shelly Tribbey shows off three new designs that will be available in May. Use the side arrows to see them all. Maggie's website is now updated with the new things. There is a third set of "Keepsake Gift" cards from Laurel Wheeler. Oasis Needlepoint has two new seasonal Love canvases. Quail Run has a new exclusive Annie Lane design called "Grande Margarita." JP Needlepoint has two new designs, each based on a song. Here's a new Pewter and Pine, available for pre-order. Ruth Schmuff shows off five new Lulu My Pink Turtle canvases. Angels and fairies and Day of the Dead—something for everyone! Kate Dickerson shows off canvases from a new artist, Maren Devine. New from Little Bird Designs, for the Valentine who is celebrating being without someone. Pepperberry's new "Key to My Heart" design, complete with key in either a gold or silver version. Needlework Retailer shows off some of the new colors of Straw Silk. Looking for an Olympic-themed canvas? Kangaroo Paw Designs has an Olympic Angel and a USA angel, too. Mary Tussey has four new heart designs. BB Needlepoint has a lovely new bird of paradise design. Colour Complements has introduced their new Spring 2018 Collection of pastels, in colors perfect for the Easter Bunny's eggs. Zecca's updated their website with the new designs from Linnea Riley. Cute! David McCaskill has a new design, too. Pewter and Pine has a new design. Unique New Zealand has updated their website. Melissa Prince has updated her website. The Needlepointer shows off the new Pippin designs. Maggie has updated her website with the latest new designs. TNNA isn't the only trade show shops go to. Suzie of Enriched Stitch/Vallerie Needlepoint Gallery went to the Gift Show in NYC with Amanda Lawford, whose line she owns. Jinny shows off the four newest holiday sayings rounds from Burnett and Bradley. Needlepoint.com is offering these as a kit with guides. 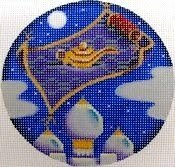 Kathy's latest charts for Needle Delights Originals are posted on her blog. Cooper Oaks has some cute antique French heels, intended to be made up as pin cushions. CBK has updated their website with all their new things. Julia Snyder has a new book. It is an index of all her stitches only, showing which of her previous books a stitch is listed in. Sheena shows off her favorites from Market! Enriched Stitch talks about the TNNA show as well as their newest designs, clubs and classes in their shop newsletter. Louise's Needlework just posted 40 photos of new things on their shop Facebook page. Maggie posted a wonderful new fishing canvas, complete with custom frame from Deux Bijoux Bijoux. Enriched Stitch (aka VNG) reports back on the show. Ruth Schmuff shows off the new Zecca rugs—beautiful! If you love silk threads, check out The Silk Mill's newest colors: neutrals, pastels, and a lovely deep blue and vibrant orange. Stitch By Stitch Larchmont's latest e-newsletter has lots of photos of new items and models from the trade show. The shop has also listed their favorites from Market. BeStitched has four pages of brand new items so their website so you can see the newest things they have from the Vegas show. This is nice for folks who don't want to use Pinterest or Facebook. Needlepointing in Your Nest has added lots of photographs to her Facebook page. Amy Bunger shows off new monthly weathervane canvases from Rebecca Wood. Enriched Stitch shows off the new "Thunder" series from Amanda Lawford/VNG. Laura Taylor shows off her favorites from the Las Vegas show. The Needle Works' blog has photos of new Hug Me and Avtnti bags, plus designs from Danji, Paint, Painted Pony, Leigh Designs, and Charley Harper. Suzie at VNG shows off all the Kim Leo designs now available plus the brand new Kimberly Hodges pieces. Funda Scully shows off 7 of her little boxes. Here is a brand new Charley Harper called "Summer Birds." Stitch By Stitch Larchmont is posting lots of photos of new things on their Facebook page. They are grouped by designer or distributor so scroll through. The Wool and the Floss shows off three sets of photos of new items from the new designer Tina Griffin. Kurdy Biggs just posted three photos of the Threedles display in Vegas. Louise's Needlework did a quick video of the cute self finishing canvases from Whitson Designs, a new designer. Enriched Stitch shows off new animal designs from Fab Funky, another artist that VNG represents. The Needle Works has posted a sneak peak of things from last night on their Facebook page. Here is Christmas Glow again (Sandra Gilmore/Fleur de Paris) and a colorful hearts canvas from JP Needlepoint. Here is Sandra Gilmore's "Christmas Glow" complete with LED lights! Lousie's Needlepoint also posted two photos of new Kathy Schenkel pieces, little snow cone Santas and a full snowman collage piece. Waste Knot posted two photos of new Kathy Schenkel mini socks with felt toys that go inside on Facebook. There's a little green man, an astronaut and a deep sea diver. Use the right side arrow to see everything. Suzie at Vallerie Needlepoint Gallery has updated the VNG website with the new things. Sadly, there isn't a What's New section. But this is where you will find her own designs, wonderful animals from Scott Partridge, Amanda Lawford and Dereck Clark designs and more. For a closer look at Scott Patridge's work, check Suzie's Enriched Stitch blog. Pocket Full of Stitches shows off new designs from Alice Peterson and Sew Much Fun. Their blog also has new things from Pajamas and Chocolate, Hillary Jean, and A. Bradley. There are twelve new colors of Pepperpot Silk. Maggie shows off more Emily Owens designs, some distributed by Maggie and some by JP Needlepoint. Burnett and Bradley has added Yellowstone to their National Park ornament series. I've also seen the Grand Canyon on the Stitch by Stitch Larchmont Pinterest page (link above). Zecca's website has the new things now. Melissa Shirley has updated her website. Tapestry Fair has updated their website as well. Ruth Schmuff shows off a new Kimberly design—a dragon! Pepperberry has updated their website with their newest designs. Painter's Threads has announced their #4 and #8 overdyed metallic braids will start to come packaged on spools instead of skeins. They are rolling this out now. Oh, they have needlepoint canvas died to their color schemes, too! If the solid colors generally available won't cut it for your next project, check out the colors in the second link below. Laurel Wheeler has a new series of small canvases, meant to be stitched as gift cards. Rachel Donley Needlepoint has posted nine photos showing quite a few new designs. Ada of Eye Candy shows off all her newest designs on her blog. Julie Mar has updated their website with new designs. Burnett and Bradley has a new "Explore America" series. Maggie shows off two more April Murphy pieces. Sew Much Fun has three cute new"selfie" designs. Zecca is updating their Facebook page with their new designs. Here are two new funny sign designs from CBK. Kate Dickerson has two new tiny box designs. Jessica Taylor has two new graphic pillow kits that are wonderful. Barefoot Needlepoint Design has some hilarious beach pieces, like this pelican with a snack. Ann Hanson has new leaping patterned bunny designs, available only from Barbara's Needlepoint. Lycette Designs is adding to their line of "lucky" canvases with this Ace of Spaces. Pocket Full of Stitches has posted the new Eye Candy designs on their blog. Rachel Donley has a new Gingerbread Alphabet. Sharese shows off a new Halloween design. A few new things from Melissa Prince Designs. Canvas Art by Barbi has some fun new designs that fit in the new Lee snap trays. Here's a sneak peak from Burnett and Bradley and Kirk and Bradley. Tapestry Fair shows off five new designs from their stable of artists. Melissa Prince Designs has a new wreath, "Cedar Wax Wings Wreath." The Plum Stitchery has three cute new sign designs. Rebecca Wood has 8 new stocking designs. Here's a look at one of them. Lycette Designs is doing sleeping masks. Alice Peterson shows off two new liquor designs—"Tequila" and "Whiskey." The Collection Designs shows off new Gayla Elliot designs. The Collection Designs shows off new Penny MacLeod designs. Maggie shows off three more new designs from Fred Calleri. Kate Dickerson shows off over 50 new designs premiering next weekend. There are lots of designs for Planet Earth's leather self finishing canvases! Denise DeRusha Designs has a new postcard design for Nashville. And a new one for New Zealand, too! New from Gone Stitching's Randi Paul-Heskins, and it comes with a stitch guide. New from Melissa Shirley—"Something Wicked This Way Comes." Amy Bunger is doing a guide! Enriched Stitch has their canvases (they are Vallerie Needlepoint Gallery) packed and off to the trade show. CBK shows off a new Patriotic Dog and Chair design from Laura Megroz. Maggie Thompson shows off another new Fred Calleri design, this time an aviatrix. Ruth Schmuff shows off four new designs from Sandra Vargas. Maggie has a new artist, Fred Calleri, and here is his lady in a bathing suit. Sew Much Fun has two new "drinks" canvases coming out in Las Vegas. One is Christmas-themed and the other is Halloween-themed." Laura Perrin has a new chart available, "Holiday Ribbons." Alice Peterson has a new "books" canvas. This one features fashion themes. Pocket Full of Stitches has posted new canvases on their market preview. Associated Talents will introduce new Mardi Gras masks in Vegas. Carole Lake of StitchPlay Designs has a new book coming out! Robbyn's Nest has three new Judaic designs coming out in Las Vegas. Maggie has two new small but cute Christmas designs from Stefanie Stouffer. Melissa Shirley also has a new series called Sweetheart Houses. Melissa Shirley will release six little floral hearts at Las Vegas. You can see them here. Use the right side arrow to look at them all. Danji has a new birdhouses canvas and individual bird ornaments. Raymond Crawford has a new, larger Grinch canvas. JP Needlepoint has posted a sneak peak of their new "Magical Village" on Facebook. These Harlequin laying tools will be available from Rainbow Gallery after the TNNA show. If you love San Francisco AND Annie Lane designs, this canvas exclusive to Luv2Stitch is something to check out. If you like music AND puns, this new Raymond Crawford canvas is for you. Zecca has a new canvas series of birds—this is "Ostrich." The third Zecca bird canvas is "Screech Owl." Patricia has posted five new designs from Julie Mar and Friends on Facebook. A Poore Girl Paints has a fun new slogan for pet owners, suitable for dog or cat lovers. Looks like Robin King will do a stitch-along on her cat version, too! Longing for spring? Melissa Shirley has five new Easter basket designs that will warm your stitching fingers! Here's a new Jean Smith floral, available in several sizes. Needle Works shares one of the new Ann Spiess Mills' saints, newly available from Tapestry Fair. This is "San Pasquale," the patron saint of cooks. BB Needlepoint has a New England wreath design now. Zecca has a new tiger rug and it's magnificent! Zecca also has a new floral rug that is wonderful, too. "Shining Winter Star" is Puffin and Company's latest threader, available in regular and micro sizes. The Plum Stitchery shows off new ornaments ready to order. Enriched Stitch shows off new projects from Amanda Lawford and Vallerie Needlepoint Gallery that will premier in Las Vegas. Stitch by Stitch Larchmont has a few Christmas shop window ornaments from it's yearly shop series available. Shana Brook has the new Love and Hearts beginners' kits ready for sale at NP Inc. in California. Needlework Retailer shows off one of the state-shaped designs from Kangeroo Paw Designs. Needlework Retailer shows off two new dimensional bell designs from Labors of Love. Julia Snyder shows off three new designs from And More. Needlework Retailer shows off Pashmina from Gloriana, a four ply cashmere/silk blend in a limited range of colors. Kurdy Briggs shows off the new stocking top design in four color ways from Threedles. Starke Art has this great Baby Sleeping canvas to appear at CBK's booth in January. Needlework Retailer shows off the new colors in the matte rayon thread Capri from Rainbow Gallery. HSN Designs has a new yoga bee design from Cheryl Dunlap. Mary Tussey of Colors1 has new "Elf Hat" and "Elf Slipper" designs that can be personalized. The Royal School has a new set in the gift shop—a mug, magnet and coaster that all read "I'd Rather Be Stitching." For the stitcher who has everything else, but must order from England. Bailey Jack has added author Harper Lee and five more favorites to the And More line of author canvases. This herringbone Alabama star will be available in January from Raymond Crawford. Rachel Donley posted a sneak peak on Facebook of what appears to be a Christmas calendar. Needlework Retailer shows off the "Bicycle Built For Two" series of oval ornaments from The Pointer Of It All Designs. Threadnuts (which imports the Painters Thread lines from Germany) has teamed with Foxwood Crossings on a new geometric design that uses five different Painters Threads. Laura Perin has new designs, four tiny Miniature Holiday Quilts! The charts for all four come in one package and you can stitch a background or not, depending on your mood. See the charming Christmas patterns on Laura's blog here. You can buy directly from Laura if you like (second link below). 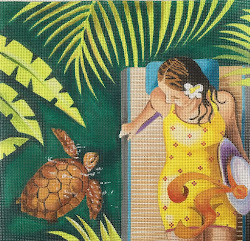 Needlework Retailer shows off "Kayaks on the Beach," from Pippin Studio. Beeswax Bliss is being marketed as a replacement for Thread Heaven which is no longer available as the company owners want to retire. Deborah shared the finished version of her own Small Santa Star on Facebook. It's available at her Dragon's Tale Direct Etsy store (second link below). DebBee's Designs has finish the newest piece, "Mostly Amadeus." There is no release date or venue yet. This Carolyn Schmitz portrait of a pronghorn antelope is no longer a shop exclusive so your favorite store can order this from Sundance! The newest Harley Durden design is this Harry Potter inspired "Wesley sweater" design. These are an exclusive to In Stitches Atlanta. Cynthia Thomas has stitched this amazing Queen of Hearts from Melissa Prince and it will be a class at the Las Vegas show, taught by Melissa herself. Deux Bijoux Bijoux is making a coordinated playing card box to display it in. "Dewdrop" is being stitched by Barbara Elmore of Sundance. It'll premiere in January. The design is adapted from Carolyn Schmitz's artwork for Sundance. Written by Jane/Chilly Hollow Blogging at http://chillyhollownp.blogspot.com and at http://chstitchguides.blogspot.com © Copyright 2018 Jane M. Wood. All rights reserved.